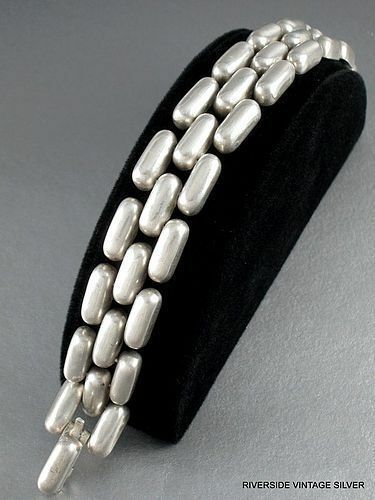 Handmade sterling silver bracelet designed & signed c. 1940's by Taxco, Mexico designer William Spratling (1900-67). Bracelet measures 7 1/2 wearable inches long & 3/4" wide. Weighs 56 grams. Signed on the clasp. Pictured on Goddard's spratlingsilver.com. Spratling designs are included in permanent museum collections around the world including Los Angeles County Museum of Art & Museum of Fine Art, Boston.